Mosaic Jewish Primary School is an Ofsted Outstanding Free School which opened in September 2013. It is located in Roehampton. 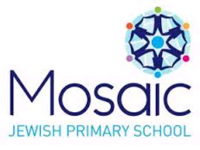 Mosaic Jewish Primary School is a cross communal, mixed school dedicated to creating an environment in which children can grow to their fullest potential as responsible and dedicated members of the Jewish Community and of British society. The school is independent of any synagogue authority and welcomes pupils of all denominations and levels of religious observance as well as non-Jewish pupils who wish to share in the high standards of academic achievement we aim to deliver. Please contact Mosaic Jewish Primary School for more information.